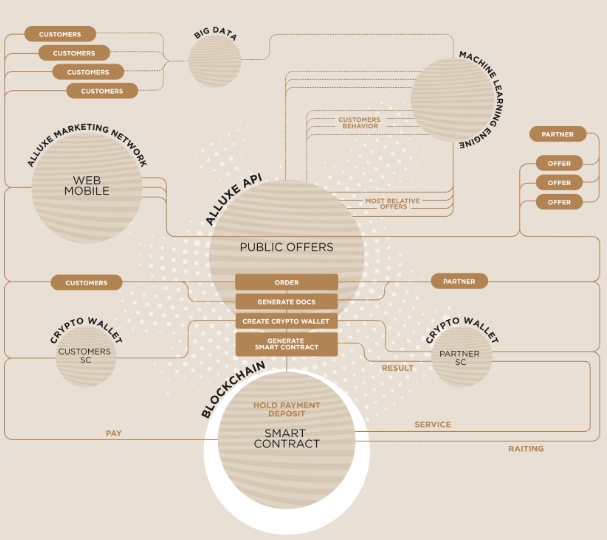 ALLUXE is a blockchain-based luxury platform intended for a convenient and transparent interaction of companies and customers in the luxe segment through cryptocurrencies and modern technologies. This is an innovative solution for the crypto-elite, wealthy people demanding to the level of comfort, quality of service and confidentiality. 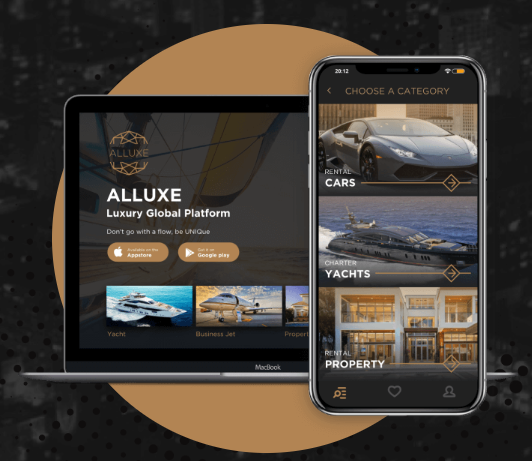 Alluxe.io helps you plan a trip or a business trip, rent a premium car, yacht or luxury real estate and make expensive purchases anywhere in the world.The ALLUXE company aims to remove the barrier between the crypto elite and suppliers of luxury goods and services. Users of the platform will be able to make universal payments in any convenient currency: whether it is euro, dollars or a crypto currency.A new class of wealthy people has formed, the so-called crypto elite. These are people who desire a luxurious lifestyle and keep most of their fortune in cryptocurrency. But it turned out that the service, sales and rental of goods (including the luxury segment) sectors are developing slower in this area. Just a few luxury goods vendors accept cryptocurrencies as a payment method. This imposes certain limitations on a wealthy cryptocommunity. One of the main features of Alluxe.io is the use of the Blockchain technology that made it possible to make the platform transparent, open and safe for all participants of the transaction, to reduce transaction costs, business costs and simplify the process of buying and renting. Smart contracts contribute to the full automation of bureaucratic procedures, while decentralization changes the logic of the transaction process and sets new standards for the benefit of all users of the system: lessors, lessees, sellers and third parties. No geographical boundaries. Buy goods, rent property and pay for services anywhere in the world! The company goal is to create a global blockchain-based platform, which will allow customers to use only one service for buying, selling and renting various premium products in the selected region of the world, ensuring maximum security of transactions and confidentiality of data. The main objective of the company is to create a convenient platform (Luxury Market Place) capable of uniting a large number of partners with a wide variety of luxury goods, and potential customers interested in purchasing/renting such goods. After creating a critical mass of partners (service providers and goods suppliers), we will be able to provide the widest possible range of goods to attract new users, which in turn will significantly expand the customer base of the system. The company mission is to provide fast, convenient, simple, private and safe access to luxury goods while making the cryptocurrency more accessible, and to support the development of new technologies in the financial industry. We are convinced that the premium goods segment is the sector that will develop and improve in the near future thanks to IT technologies. There are all prerequisites for the luxury property rental and purchase segment to reach a new level of development namely through the use of Blockchain technologies, smart contracts, and cryptocurrencies. 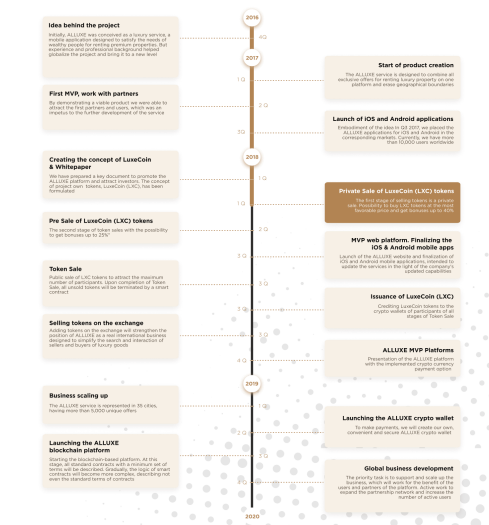 The implementation of the ALLUXE company will allow the crypto loyal community to experience all the advantages of using a decentralized system, an open and transparent process of search and booking/registration of offers, confidentiality of personal data, universal payments, fraud protection, current database of trusted lessors and sellers around the world, and also a lot of nice details. LuxeCoin Token (LXC) is the own cryptocurrency of the ALLUXE platform, designed to simplify the standard approach to renting and buying luxury properties and enhancing transaction security. LuxeCoin will be supplyed on the basis of the Ethereum platform and fully comply with the ERC20 standard. The support of this standard guarantees the compatibility of the token with thirdparty services, and also ensures ease of integration and is not limited only to the platform ecosystem. 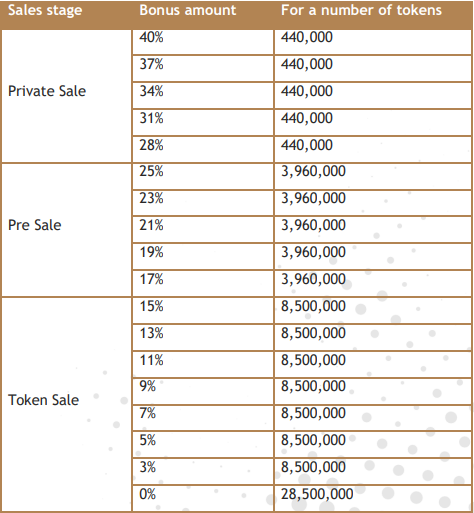 The goal of Token Sale LXC is to develop the ALLUXE platform and its complete commissioning as quickly as possible. The revenue from the sale of LXC tokens will be used to create the platform and its applications, for operating expenses and business deployment globally in certain target markets (priority markets include the USA, Europe, the UAE, Asia, etc.). The LXC token will act as an alternative currency in the system, the rate of which will be somewhat more profitable than any fiat currency or cryptocurrency. For using the token to pay in the service, additional bonuses will be accrued. Ability to make both internal and external settlements between the members of the Alluxe platform. Better offers when paying with LXC tokens. Loyalty and cashback program for making transactions and purchases in LXC. The Alluxe.io Bounty program is aimed at popularizing the product and developing the company. By expressing gratitude for the support and at the same time demonstrating confidence in the potential of the platform we have developed, we have allocated a part of the tokens to form a bounty pool. Active users of the service will be encouraged by LXC tokens for positive actions aimed at disseminating information and promoting the product. Alluxe.io set ourselves ambitious plans for the development and growth of the platform, increasing the number of active users and partners. In an effort to maintain a stable business, which is profitable for all community members, we laid a solid technological foundation and ensured high performance and scalability of the platform. During our work, we have established long-term partnerships with leading companies in the luxe segment, which specialize in the rental of premium and sports cars, housing rental, yacht charters, technical industries and luxury goods trade. At the same time, we are continuing to expand our partner network and increase the number of offers to make ALLUXE an even more attractive product for our customers.